I am a lover of salsa. Chunky or smooth. Mild or spicy. Red or green. Blender Salsa or Pico de Gallo. Heck, I'm even throw fruit salsa into the mix. I mean, grilled chicken breast or fish with tucked under a small blanket of natural sweetness from the fruit mixed with onion and heat. Mmm-hmm. 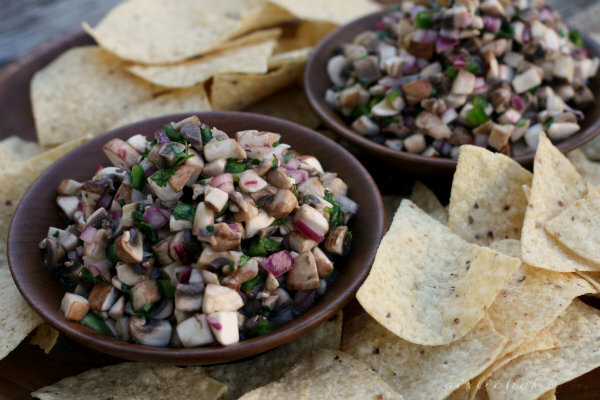 And, of course, mushroom salsa. Wait! What? 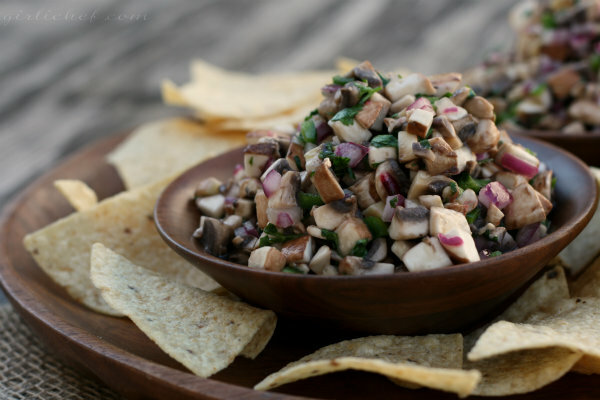 You've never tried Mushroom Salsa before? Never even heard of it, you say? Okay, neither had I before last month. But when I saw it sitting all pretty on the pages of the soon-to-be-released cookbook from the gals at Muy Bueno, I just knew that I had to try it. I mean, it sounded kind of strange at first, but the more I paged back to look at it, the more the thought of it grew on me. I'm a fan of mushrooms. I'm a fan of jalapeños and red onion and lime juice and cilantro. So why wouldn't I be a fan of it all chopped pretty and tossed and served as a salsa? No reason I could muster. Let me tell you, I found it every bit as hard to resist as I did "regular" salsa. I scooped 'em up with crunchy, salty tortilla chips and munched on 'em while watching the game. The salsa was nice and earthy and pungent with a welcome tang from the lime juice. The longer you let it sit, the more liquid the mushrooms will soak up and then release. I had some later on in the day over simple sautéed Tilapia and the combination was perfect for a light meal. 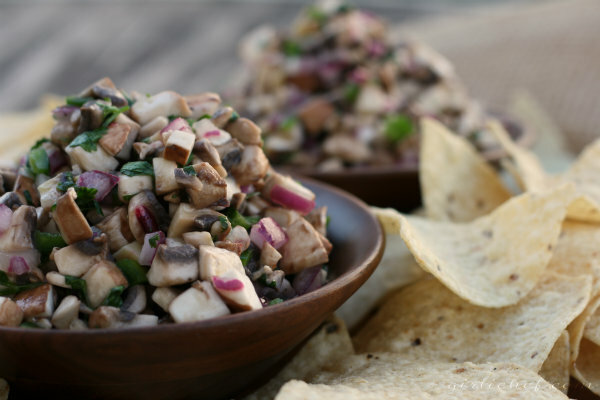 I like raw mushrooms, so I enjoyed eating it immediately after I made it, but the tastes develop a more complex flavor once you've let it sit and marinate for at least one hour. It's even good the next day (refrigerate if you're saving it that long). This is the first thing I've made from a long list of things that I want to make in the Muy Bueno cookbook. Please visit the Spotlight announcement page for more information and to see how everybody else's salsa (or Capirotada) turned out this week. And then follow along for more delicious goodies over the next three weeks. Plus, I mentioned that everybody will be giving away one copy of this book and I happen to know that somebody has already announced their giveaway - so you're not going to want to miss a single post in this Spotlight! 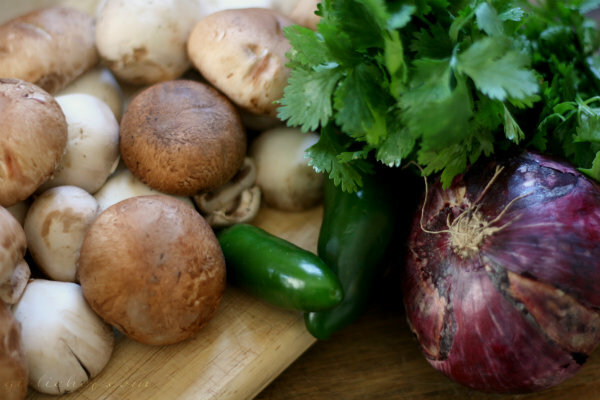 Combine mushrooms, onions, jalapeño, and cilantro in a bowl. Add lime juice and olive oil and toss to coat. Season with salt and pepper to taste. Eat soon or let sit a couple of hours at room temperature (this will allow the mushrooms to absorb all of the flavors further) before eating. Use this salsa as you would any salsa: scoop it up with tortilla chips or use it as a topping for fish, chicken, or steak. For the mushrooms, I used half white button mushrooms and half crimini mushrooms. I reduced the lime juice called for in the original recipe by ¼ cup.